As you can imagine, these early weeks are critical to the ocelots’ growth, so they remain quietly and safely off view with their mother. But thanks to the great work of our keepers, vets, and staff photographer, you get to watch the kittens grow behind-the-scenes as we post more photos, videos and stories. Want to be the first to see new videos? Subscribe to our popular YouTube channel at www.youtube.com/woodlandparkzoo. Here's the latest snapshot of the two ocelot kittens--now 5 weeks old--taken Tuesday at their weekly weigh-in. 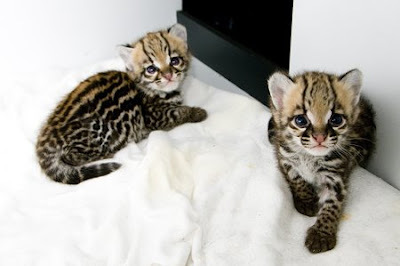 The ocelots are doing well behind-the-scenes with their mother. Their father is out on exhibit now in the Tropical Rain Forest building. Uzumma, who turned one year old this October, has been boldly venturing away from her mother and exploring the new trees recently installed in the gorilla exhibit. Many of us have spotted her playing around the base of the trees before, but this weekend, one of our photographers caught Uzumma testing her climbing skills on the 30 ft tall trees. Word is she made it about half way up several times! Have you seen her go higher? Let us know! Last weekend's Pumpkin Prowl was a howling success with three nights of spooky fun (and some pretty great treats, too!). Today TV camera crews and some lucky guests got a sneak peek at what this weekend's annual Pumpkin Bash has in store for visitors. 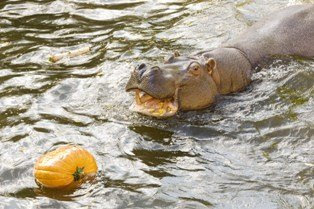 The zoo's three hippos were treated to some pumpkin bobbing. 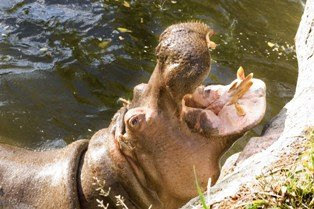 The hippos hilariously lined up with their mouths gaped wide open, waiting patiently for the keepers to toss the pumpkins right in! 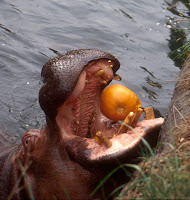 But our keepers wanted the hippos to work for their snack, so the huge pumpkins were tossed into the pool and the hippos swam after them, chasing them around like they were bobbing for apples! Watch them in action--and turn up the sound for full, spooky Halloween effect! You can catch the hippos plus many, many more animals smashing, stomping, and chomping on pumpkins at Pumpkin Bash this Sat. and Sun., Oct. 25 & 26, 10:00 a.m. - 2:30 p.m. Photos by Tianna Klineburger. Video by Ryan Hawk. 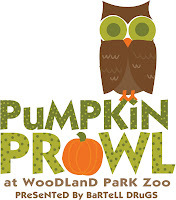 Halloween is almost here and Woodland Park Zoo is getting in on the action early with this weekend’s Pumpkin Prowl event, Oct. 24-26. Pumpkin Prowl is three nights of ghoulishly good times with trick or treating for kids, live entertainment and Zoomazium transformed into Boomazium! We’re getting ready now for the event, unloading hay bales, carving HUNDREDS of pumpkins, and decorating the zoo! Want in on the fun? Tickets are on sale now at zoo gates, or buy them at any Bartell Drugs location and save $2. Pumpkin Bash at Woodland Park Zoo – Oct. 25-26, 10:00 a.m. – 2:30 p.m.
Watch the zoo’s animals smash, chomp, and stomp on pumpkins! Mysteries of Ancient Egypt at Burke Museum – Oct. 26, 10:00 a.m. – 4:00 p.m.
Meet Nellie, Seattle’s only Egyptian mummy, making a rare appearance out from behind the scenes. We are celebrating the birth of twin galagos, an African primate also known as a “bushbaby.” The galagos were born October 11. 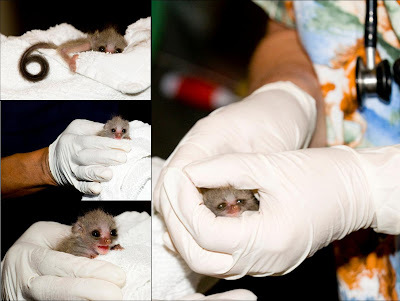 Pictured here, the galagos received their first vet check-up on Fri., Oct. 17. All is well! 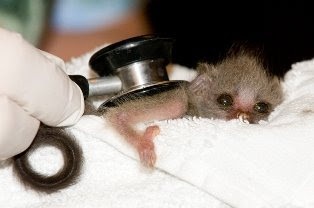 The large eyes on this small creature are an adaptation to their nocturnal lifestyle in their native African habitats. The galagos are on view in the Night House exhibit, but the babies are staying close to their mother near their nest box, so it may be difficult to spot them in the dark! New western pond turtle hatchlings pop out of their shells! Some tiny new pond turtles hatched today, just the start of their journey being raised here at the zoo until large enough for release back into the wild. Welcome, little turtles! View the slideshow of their "break-through"! The Search is on, Seattle! The UW and The Seattle Times are back with a 3rd year of the popular Emerald City Search. 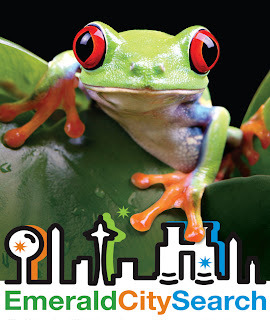 This year, the search is sponsored by Woodland Park Zoo with a special Year of the Frog theme, to help promote our amphibian awareness campaign. The first clue to help you find the hidden Emerald City Search medallion was revealed in The Seattle Times today, and an additional clue will be printed each day for 10 consecutive days. The clues, written by UW experts, are tricky, so consider working with a friend to solve the riddles and find the location of the medallion. First contestant to find a medallion hidden somewhere in the city wins $2,500 in cash and prizes. 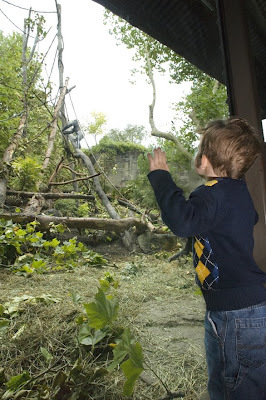 Here's video of six-year-old western lowland gorilla Calaya mastering the new upright trees and vines recently installed in the gorilla exhibit. This footage was taken at the very first moment Calaya encountered the new structures, and as you can see, she wasted no time in checking them out! The new artificial trees and vines installed in the exhibit will stand up to the rough and tumble of playful (and heavy!) gorillas for years to come. 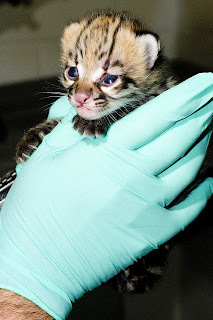 The ocelot kittens got their first neonatal exam and were given a clean bill of health by their vets! Newborn ocelots are blind at birth and are helpless for several weeks, relying solely on their mother for care and nutrition. Staff continue to have minimal physical contact and monitor the mother and kittens in the birthing den via a web cam only. We hope to have them out on exhibit in 6-8 weeks. Until then, stay tuned for more video and photos! Calaya took to the trees last week as our gorillas were treated to their newly "decorated" exhibit. Two custom-made metal and concrete trees were the main reason for the exhibit makeover. Created by our talented Exhibits crew, the trees--one weighing more than one ton--were installed both for safety and durability. As you can imagine, a 300-pound gorilla jumping on a rotting tree branch can have consequences, so these realistic trees were made to allay any fears of gorillas raining from the trees! 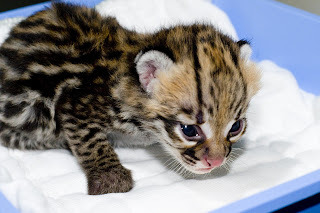 For the first time in 15 years, we are celebrating the birth of endangered ocelots! Two kittens were born last week. They are the first offspring of mother Bella, 7 years old, and father Brazil, 12 years old. The gender of the kittens is unknown at this time. 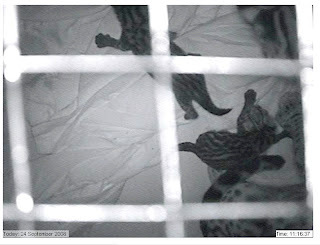 To minimize disturbance, staff have minimal physical contact with the new family and are monitoring the mother and kittens in the birthing den via an internal web cam only (from which these screenshots were taken). Things are going well with this first-time mother. She is providing round-the-clock care and demonstrating excellent maternal skills. The kittens are active and nursing regularly. It’s critical at this time to give the mother and kittens their time and space to bond and develop healthily, so the kittens will not be on public view for at least six to eight weeks. We hope to be able to update soon with photos and/or video. You can still catch the father, Brazil, on view in the award-winning Tropical Rain Forest exhibit. 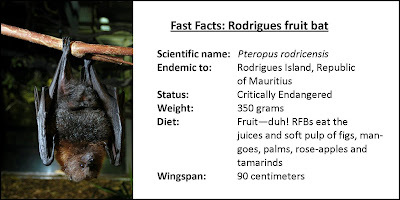 Did you know in the 1970s, only 75 Rodrigues fruit bats were left on the island of Rodrigues, a district of Mauritius? But thanks to concerted conservation efforts, those numbers are now approximately 5,500. This number can drop, however, by as much as 50% during a major cyclone, which occurs every 5 to 6 years. 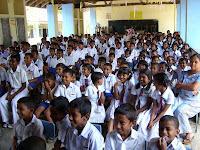 The Rodrigues Environmental Educator Project (REEP) was formed in 1998, and for the first two years the emphasis was on the bats themselves. Starting in 2000, REEP expanded their focus to include environmental issues and school programs. REEP visits 13 schools about every two weeks to conduct lessons with 5th and 6th grade children. The lessons are interactive and hands-on to bolster the teachers' standard curriculum. REEP teaches the scientific, English and Creole names for plants and animals, and takes students out on field trips: 1 to 2 trips per student, per year, during which time the students visit the nursery and the reserves, where they help plant the species started in the nursery. They also learn field journaling. Future goals include: creating endemic gardens at each of the school sites, conducting teacher workshops, expanding to secondary schools and creating a Fruit Bat Day. You can see the Rodrigues fruit bat at Woodland Park Zoo in the Night Exhibit. Look for the nocturnal megabats climbing around or hanging upside down in the darkness. Left: REEP school outing in Grande Montagne nature reserve. Photo by Kimberly Lengel. Right: Rodriguez fruit bat in Night Exhibit at Woodland Park Zoo. Photo by Milan Trykar. Our exhibit crew is putting the finishing touches on the new upright trees recently installed in silverback Vip’s gorilla group. 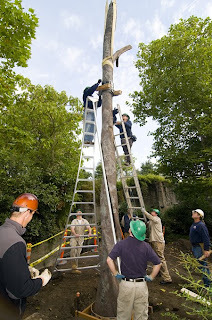 They are adding deadfall and hanging vines and hammocks to make the trees more accessible and usable for the gorillas. Then the horticulture team will bring in soil and finish planting the area. We hope to have the gorillas back out and exploring these exciting new environmental enrichment items within the next few days. If you catch any photos of the gorillas checking out the new trees, please share! You can add them to our flickr slideshow by uploading them to flickr.com and tagging them with the phrase “woodlandparkzoo” or you can email them to us at webkeeper@zoo.org.